They are immigrants, so is she. That is where the similarities end. They traveled 3,000 miles to the border, many on foot, through the northern triangle of Central America, to escape extreme conflict and violence in Quadamala, El Salvador and Honduras. She traveled to the border on a private plane at the cost of $200,000 an hour to US taxpayers. On Thursday, First Lady Melania Trump made an unexpected visit to McAllen, Texas, home to the largest immigration processing center, to visit the child victims of her husband's "zero tolerance" immigration policy. Trump's policy, announced by Attorney General Jeff Sessions on May 7, 2018, instituted the new practice of separating familes at the border as a means of deterring illegal immigration. It has since resulted in the taking of over 2,300 children away from their parents, often under the false pretense of seeing them again within 48 hours. Under extreme public pressure and outrage, including condemnation from all former living First Ladies, the President temporarily reversed the policy yesterday, but without a cohesive plan for reuniting families. The children of all ages, including toddlers and newborns, are spread out over 17 states, in more than 100 shelters run by the Department of Health and Human Services (HHS). 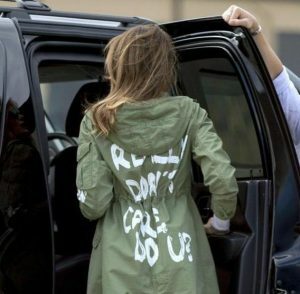 The elusive First Lady has sometimes elicited public sympathy for the embarrassing actions and infidelities of her husband, but few could find compassion or understanding in the message on the jacket she chose for the occasion: "I Really Don't Care. Do U?" who occupies the White House. 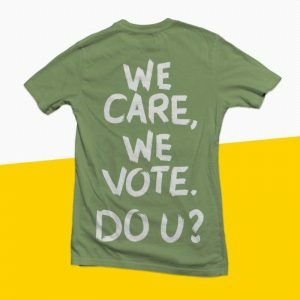 Help DemList Keep You Informed with a Contribution!